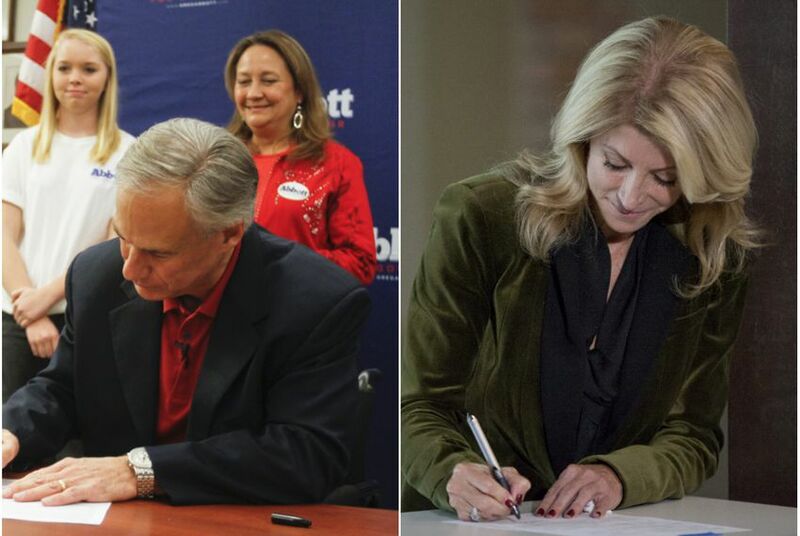 Wendy Davis and Greg Abbott made their candidacies for governor official on Saturday by filling out the paperwork and paying the $3,750 fee to file in their respective primaries. The leading candidates for Texas governor made it official Saturday, submitting the required paperwork and fees to compete in their respective primaries, giving pep talks to volunteers and laying out a couple of key attack lines a year ahead of their expected general election showdown. Democratic State Sen. Wendy Davis of Fort Worth went first, signing her application and paying the $3,750 filing fee at a downtown Austin mailing facility. Republican Attorney General Greg Abbott, who began the day going to door-to-door looking for voters in Austin, followed suit shortly after noon at his state party headquarters. Speaking to reporters afterward, Abbott said it was vital to keep the state government in Republican hands, warning that Davis would wreck a strong Texas economy with liberal policies. The latest University of Texas/Texas Tribune Poll showed Davis is within single digits of Abbott, but winning will be a steep climb: Democrats haven’t won a statewide race in Texas since 1994, and in the most recent reports, Abbott had about 20 times more money in the bank than Davis. Davis did not mention Abbott by name, but in remarks to volunteers, she took a veiled swipe at Republican leaders by suggesting their big donors hold too much sway in Texas. Abbott, the leading candidate in the race, is a former Supreme Court justice and is in his third term as attorney general. Davis, elected to the state Senate in 2008 after serving on the Fort Worth city council, rose to fame after temporarily derailing a restrictive abortion law with an 11-hour filibuster this summer. Republicans passed the measure, known as House Bill 2, in a subsequent special session. Now that the law has taken effect, at least nine clinics have closed because they can’t meet the stringent new requirements of the law and at least 100 women have had their appointments canceled; many more were unable to schedule them. “As a pro-life Texan, we want to do all we can to protect life in the state of Texas and that is exactly what HB 2 does,” Abbott said. “And we will continue that fight.” Pro-abortion rights protesters, holding signs and chanting slogans, were gathered on the sidewalk outside the Republican Party headquarters where Abbott was speaking. “Hey, hey, ho, ho, Greg Abbott has got to go,” they yelled. Despite her fierce battle against the restrictions and the ongoing clinic closures that have resulted, Davis has not made access to abortion a major plank of her nascent campaign. She was asked Saturday if she was running away from the issue. “I’ll never run away from making sure that women are safe, I’ll never run away from working to make sure that we have adequate health care, adequate choices and protection of very private decision-making for women,” Davis said. “That’s the way Washington thinks,” she said. Davis was also asked if she has taken steps to avoid appearing with President Barack Obama, who is not exactly a popular figure in Republican-ruled Texas. When he was in town last week for a fundraiser and to promote the Affordable Care Act, Davis was on the other side of the state, campaigning at a pre-planned event in South Texas. But she suggested she would have been happy to meet with Obama had the scheduling worked out. Davis did not answer a question about whether she would like to meet with Obama in Texas and her campaign did not immediately elaborate. Both of the major candidates filed on the first day the law allows. The filing period for the March primaries runs through Dec. 9. Conservative activist and author Lisa Fritsch filed in the GOP race for governor shortly before Abbott did on Saturday, as did candidates for other statewide and legislative races.